We would love to hear your experiences of Paying it Forward in your communities. Please share them by emailing admin@payitforwardinmemoryofjohndye.net * . If you would like to submit a RAOK reflection anonymously, please indicate that when you email us and we will withhold your name. Please respect the privacy of those you lent a helping hand to by using aliases or foregoing the use of names altogether and keeping other identifiable details out of your reflection. Thank you! Every year my city has a giving drive. They set up a web site and bunches of charities post about their project. People can then choose which to support. This year I made donations to a group providing medical care for at risk and low income populations and another which keeps a food pantry stocked at our local state college. I made a donation to Big Brothers, Big Sisters in honor of some friends. I also donated to a friend's campaign for Relay for Life. While at the store, I let a gentleman cut in front of me in line because he had only a couple of items and I had a cart full. It just seemed like common sense to me but I was really touched by how pleased he was. He thanked me several times. It really is the little things! I donated to my workplace's fundraiser for a local food pantry. 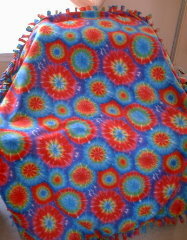 I spent John's birthday weekend making fleece blankets. Unlike those I've made before, I decided to hang onto these so I always have some at the ready for when friends, family, or strangers might need one. The other day, I went to the bank. This is the same bank that I usually go to, and I often see a teller in there named Elena, who I think is from Russia. I have been going to this particular branch of the bank for a couple of years, and I have noticed that whenever Elena waits on me - or anyone else - her face lights up with one of the most genuine, beautiful, loving smiles I have ever seen. Her smile could light up an entire room. She is also very patient and kind, going out of her way if you need help with something. Her gentle, humble, loving soul shines right through her. And I believe that only God's Holy Spirit can make a person like that. After she was finished handling my transaction, I knew I had to finally say something to her about it. So I said, "Elena, I just have to tell you, that you have such a beautiful smile, and it makes your entire face light up. And every time I come into this bank and see your smile - you make me feel so good inside. You have the face of an angel, and you are always so kind to me. If only there were more people in the world like you." Elena was very moved by what I told her, and I could see the tears in her eyes. She reached over the counter and squeezed my hand. I became teary-eyed, too. If we didn't have the counter between us, I would have given her a hug. I felt SO good that I finally told this beautiful soul what a positive effect she has had on me. I also plan on telling the bank manager about Elena, and hopefully he will, in some way, acknowledge her value as an employee. I have been making a habit of doing this kind of thing for several years now. And I always get the same response. People are stunned to be told such a thing...to be acknowledged and appreciated. Their eyes often fill with tears, and then I give them a hug, and it's wonderful...it's so healing...our souls need that so badly...it is a glimpse of our Heavenly Father's beautiful, loving Spirit, I believe. If you ever come across someone who is especially kind to you, and goes out of their way to help you, or even if you simply feel touched by their smile - please TELL them about it. They need to hear it. It will make them feel so good - and YOU, too. Don't allow your shyness to stop you. We need to encourage them to continue to be a shining light in a dark world...as God's own Holy Spirit reaches out to people, through other people. Considering all the turmoil I've been through in the past couple of weeks, Elena's smile was like a healing balm to my soul. Both Elena's smile, and my acknowledgement of it - reminds me of something that Mother Teresa said - "We can't all do great things, but we can do small things with great love." I donated toys for Christmas gifts to a shelter for abused women's children. I donated some blankets to people who needed some holiday cheer and supported small businesses and artisans by purchasing several Christmas gifts from them instead of large corps. I also participated in a pet store's fundraiser which involved raising money for animals and also donating a plush toy to a child in need. This November, I donated to Catholic Relief Services’ fund for typhoon recovery in the Philippines. I also bought some toys and art supplies for inclusion in my work place’s shoe boxes for Operation Christmas Child. A few years back, a co-worker was killed by a drunk driver. In her memory, I donated to a fundraiser for an organization that combats drunk driving. My workplace collected toiletries for donation to various shelters so I participated in that and when I mentioned it to my mom she donated some things, too! Also, I've started carrying pocket crosses I made along with my PIF angels. A couple weeks ago, I was checking out at a store and the cashier started venting about some things going on with her family. I could tell she was pretty distressed so, when I noticed she had a cross necklace, I gave her one of my pocket crosses and told her I'd be praying about her situation. I helped sponsor my cousins in a walk to raise money for their grade school and made a pledge towards the goal of a friend walking for NAMI (National Alliance on Mental Illness). I made a donation to the Wounded Warrior Project. It's an organization I became aware of while searching for information on Tour of Duty and I like to give to them in John's memory when I can. While I was on vacation this month I would leave an extra tip and a website Leave Behind card with "Thanks for your service" written on it when we ate in restaurants. I also left a card with a note at the condo when we checked out. And as we shopped and did sightseeing, and I struck up conversations with people, I'd give them a Leave Behind card with one of my crocheted hearts attached to it. Earlier this month (July 2013), my parents took my siblings and me on an Alaskan cruise. We had a great time and it allowed me to perform some new RAOKs. I left a few PIF angels around... far from any of the others! I also discovered that I felt much less shy being around people I didn't know from Adam. So I took the time to congratulate a newlywed couple, a girl celebrating a milestone birthday, and two Vietnam veterans (you can tell a lot about people from their clothes). The first veteran thanked me and then said that what really mattered is people who serve their country in *any* way. I thought that was really awesome because while I think our armed services make staggering sacrifices, it's important to remember that many others do, too, from emergency personnel to teachers and so on. His humbleness was inspiring to me. He seemed kinda surprised that I'd said anything which made me think that probably veterans don't get thanked enough. So I want to get better about doing that... not just when on vacation. I met the second veteran inside a Russian Orthodox cathedral. He'd become a deacon and I felt blessed to learn a little about his life and his faith. After all the rush and such, it felt pretty great to just slow down, pray, and be surrounded by centuries of evidence of humankind's devotion to God and His to us. While there, I made a donation and lit a candle in memory of John, his mother, and my loved ones who have passed on. It was a really moving experience. With those two gentlemen, it felt more like being on the receiving end of a RAOK. In both cases, it made me feel grateful for John's work on Tour of Duty because that show is what really woke me up to the fact that we need to show our appreciation for those who gave so much for their country. I made a donation to Lynn Dye's church in memory of her on her birthday. I have paid for the driver behind me in the fast food lane and I got some Chick-Fil-A coupons for free food and attached a PIF card and dropped those around in honor of Lynn Dye's birthday. A co-worker's husband has been having some health issues so I sent home dinner for the couple. I joined in with some others at my workplace to support an organization that provides social programs and more for the disabled. Got my water project started (getting filtered water at our local CMHA Wellness Development Center)! I am so very exited... It will be a riot!!! Here to wellness and water!! Like so many, I was saddened by the loss of lives and homes in Moore, OK. I have family living very near Moore and know how special that area of the country is. I donated to a food pantry near Moore in honor of the people there. I helped raise money for Relay for Life (American Cancer Society) this month. And, I never reported this, but, when I renewed my drivers license, I signed up to be an organ donor. In March I participated in my work place's Easter candy collection for the troops. I also used the proceeds from a sale at my Etsy store to make a donation to a cancer charity in memory of my Grandma. Then this month (April) someone asked me to make some thread angels for a memorial service so I used proceeds from that to support a charity aiding victims of the bombing in Boston. Without John and PIF, I would never have started making those angels again. I'm really glad this has helped me relearn an old hobby that others find comfort in! I’ve been hitting the fast food places a lot lately, so I do like to pay for the order behind me. I’ve done that. Also, I’m trying to attend my niece and nephews events, and support their causes at school…my niece’s class designed a t-shirt that they are selling and the money will go to the Sandy Hook school/community. She also jumped in Jump Rope for Heart…and, we have a Relay for Life team at work, so we are doing fundraising activities for that this month. I am also still crocheting the little hearts, only, now in different colors and giving them to people. I’m singing in the neighborhood church choir now, as well. those are the little things I’m doing. sometimes the little things mean a lot to others. I bought nice shiny stickers today and gave them to a few people. It is so nice to talk other people who I do not know as well as the ones that I do know..My dog is a very good way to make an outing great as well..we talk to the owners and have a friendly conversation about our pets. I just try to go with the flow and try to do what I am able. Smile, say hello, share coffee with a friend. For the first time ever I've been doing a Bible study. It's been really wonderful so I wanted to do a little something for the other ladies. I've recently rediscovered how much I enjoy plastic canvas crafting so I made them and a few friends some hearts. My city got a lot of snow and then it melted and refroze. My neighbors on either side are older and while their sidewalks had been cleared of snow they ended up icy after the melt and freeze. The city will ticket people for icy sidewalks. Mine had refrozen too so I cleared it and was really tempted to go back inside since it was so cold but then I thought of John. I'm not sure why i thought of him then. So then I cleared my neighbors' sidewalks too because of that. I hope it saved them some trouble and kept the people who walk to the store up the street safe. I took Candy Hearts to the Wellness Centre Yesterday..I had so much Fun!!! Everybody loves those little cinnamon hearts. 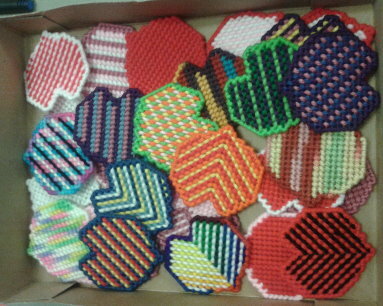 I crocheted a bunch of little valentine hearts and I've been passing them out this week. I will continue to do this all month as this is National Heart Month. I donated to a fund for the Sandy Hook community in Connecticut. I was heartbroken to hear of the loss of life there and continue to pray for all the family, loved ones, first responders, and town. Someone who was at my Grandma's funeral and saw the thread angels I made in her memory asked me to make some for one of their loved ones. 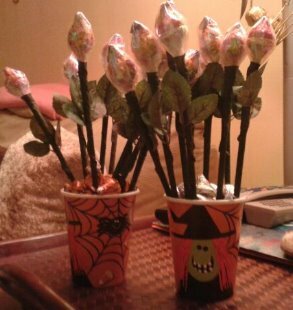 I made 25 for them to give out to their family members. I also made some Christmas angels in memory of those who lost their lives at Sandy Hook Elementary. I've been giving them out and plan on continuing to do that. My 12-12-12 RAOK was to take a basket of Christmas peppermints to choir practice for folks to eat during our dress rehearsal for our Christmas program. A few of us at my church did adopt a Grandparent and we are giving them special gifts. These people are in the assisted living/nursing home. Many groups need help with all aspects of getting toys to children. Right now I am helping out with multiple agencies. There is so much involved in delivering gifts to families. That is just the last step! Most agencies that I have helped are swamped! They really appreciate the help. I spent a lil time RAOKing around the Christmas tree yesterday. ;-) My workplace is gathering items to give to kids who are aging out of the foster care system so I got 6 winter hats and 6 pairs of gloves for the boys. I'm really glad someone at my office thought of it. I used to babysit foster children but always very young ones. I hadn't thought much about what happens when those lil kids become big kids and are on their own. If anyone's ever looking for something to do, maybe contact your local department of Health and Human Services or the like and see if they have a similar program. Since today is 12/12/12 it seemed like a good time to participate in the 12 RAOKs of Christmas challenge. I didn't know what to do then saw it was National Cocoa Day. So I treated my co-workers to cocoa (with marshmallows and cinnamon, naturally)! I gave clothes to our community center. My office is raising money for an organization that provides comfort items (blankets, plush toys) to children experiencing hard times. I donated to our group effort. Today I went to a small grocery store...not a super store. When my total was rung up the cashier asked me if I was collecting the stamps for the appliances...(I guess like S and H green stamps for those of you old enough to remember those) Anyway, I said no, and that she could give them to a customer who was collecting them. She said she was not allowed to do that, she'd have to give them to me then I could give them away if I wanted. So, I asked the guy behind me if he was collecting them, and he said yes, so she gave it (I only earned one) to me and I gave it to him. Easy RAOK. I donated to my alma mater's annual fund. I try to do this every year but it was especially meaningful to me this year. I was in high school when I first "discovered" John Dye's work, first with TBAA and then beyond. I've been thinking a lot lately about how glad I am for that. High school just wouldn't have been the same without John! Additionally, the big project they're trying to fund this year is an arts center so I hope every little bit helps students who aspire to touch others through the arts just as John did. I just handed in my boxes for Operation Christmas Child. What a joy it is to be able to give to children in third world countries who don't have the luxuries we do. I start shopping for it in the summer. Problem is, those boxes are so small and I tend to overdo it...lol. But I have managed to get nice gift boxes that are just a smidgen bigger which you can do. I guess they just don't want us to get boxes too big. My only wish is that I could be with the children when they open their gift boxes and see the smiles on their faces. It is such a blessing each time my church hosts the VIP families. These are people who have lost their homes and are one step away from having to live in a shelter. They just need temporary housing for a few weeks until they can get on their feet again. It was my church's turn this past week to host some families. I was one of the hosts. We provide the evening meal for them as well as snacks and breakfast/lunch items. At our church, we have a community room where they eat, watch t.v. or videos, play board games and do homework. Then each family and each host has a room to sleep in. 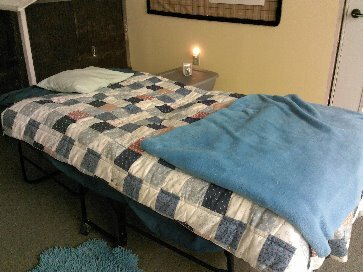 Here is a picture of my 'bedroom' it is actually a Sunday School room. Our neighborhood church participated in Operation Christmas Child. This is a program that collects 'shoeboxes' full of toys and items to be distributed to children all around the world. I helped with the GA and RA kids this week fill boxes with supplies donated by members of the church and community to send to the local collection center. They will carry the boxes to the collection center this week. I also made two boxes myself and my niece and nephew made boxes on their own. Here is a picture of the boxes I made. From Anonymous: Every year my workplace has this huge campaign to give money to United Way. It is a big to-do in my town, and my business is not the only one to really push this campaign. The way it is handled we cannot designate how our donation is used and, I don't agree 100% with how the money is distributed and how employees are asked to give. However, this year, I decided I would not give begrudgingly. I would just 'give' and not worry with how it might be used. It would still be a blessing to someone. Also, I donated to various Hurricane Sandy related relief efforts including First Book. They're a literacy group and are currently trying to get books to kids impacted by the hurricane. Yesterday, for the PIF anniversary, I volunteered at our local food pantry for the first time. I have donated before and sponsored a food drive at the library for several years but had never actually worked there. I thought it was the perfect time to start and plan to do so at least once a month. It was very rewarding and something to do to honor John. It's nice to give something back to him! Today I unpacked my fall and halloween decorations and while I was in my storage unit, I decided to go through my Christmas boxes and pull out items I could part with. I have two Rubbermaid containers of Christmas decorations and ornaments that I will donate to a church run second hand shop. This shop gives the money from the sale of the items to needy in the community. I have freed up some storage space, provided items for someone else to have, and generated money for those that need it. Three Blessings in one act. Today, I bought some Bible study materials at a local book store. Seems they have a campaign to send books to soldiers, and when they ring up your purchase, you can add the total of a book to your purchase, and they will send the book to a soldier. I added the book to my purchase. I can remember seeing Mr. Dye on an interview once and he said "Coincidence is when God remains anonymous." I have a coincidence story. I work for an event planning organization and part of my job is to do follow-up calls for RSVPs. I was calling a gentleman and was very surprised when the phone picked up and I heard what sounded like an angelic choir. I was absolutely shocked when it turned out to be the answering machine of a former co-worker. Obviously I was given an incorrect number but what were the odds of it really belonging to someone I knew? Stranger still, this person and my other former co-workers had been on my mind a lot. I've been watching the 'Touched by an Angel' DVDs that were recently made available. It made me think about where I was during those years. I started to feel badly that I hadn't done a better job of keeping in touch with the folks who surrounded me then but I hadn't done anything to remedy that. And that's when the "wrong number" incident happened. I took Mr. Dye at his word and used this "coincidence." I wrote my former co-worker to wish her well and tell her I've been thinking about her and would be praying for her. Thanks for letting me share. Thanks, Mr. Dye for all the good you brought to this world. Last night I went with some co-workers to prepare and serve dinner at the Ronald McDonald House. This is our third time doing it and every time it's been a wonderful experience. It feels really good to help provide home-cooked food to people who are away from theirs due to the children's illnesses. Since Halloween is approaching, I prepared "dirt cake" (see photo). 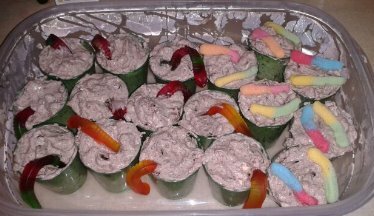 It's a concoction made of Oreos, pudding, whipped cream, and, yes, gummy worms. I think this is definitely the grossest RAOK I've done in memory of John but I also think it may be the yummiest. ;-) It was great to see the lil ones (and the grown-ups!) enjoy something from my own childhood. I feel blessed every time we do this. Plus, it's proof that paying it forward for John can be a lot of fun! Seeing John on screen made me smile. So I've tried to bring smiles to other people in small ways. In my work place I spend a lot of time emailing. Sometimes in the rush I forget there's a human on the other side of that email and give the required one word answers or send the needed file with no communication at all. But now I've started making a point to acknowledge that person on the other side. Adding a "Good morning!" or "I hope you have a wonderful weekend!" may not be much but I hope it shows the person that someone cares... and maybe they'll smile, too. I have been helping out with local drives for a variety of causes this summer as well as continuing to give donations to charities I support. The members of Pay It Forward in Memory of John Dye embarked on a school supply drive during the month of August. We kept a tally of all school supplies purchased in John's memory. The supplies were then donated to schools, students, and other educational services in our local communities. These are the results! Thanks to those who participated and encouraged us! It was so much fun to relive the excitement of going back to school and getting new supplies AND paying it forward for John! 1 book with cd to be used at the listening center. 1 write on/wipe off connect the dots alphabet book. A couple had been very kind to me and I wanted to get them a thank you gift. I saw references on this site's ideas page to supporting local businesses. When it came time to get their thank you gift, I remembered that and bought from a local business. I plan to do that more often in the future. Last month I turned 30 and found myself really thinking a lot about Mother, Mother, a short film John starred in. In the movie, John's character (Jeff) has AIDS and is nearing his own 30th birthday. There's a heartbreaking line in which a friend of his comments to Jeff's mother that he may not have a 31st birthday. I thought about that a lot in the days leading up to my own 30th... maybe a little too much. However, it made me reflect on how grateful I am that I have every expectation of celebrating my 31st birthday and beyond. It also made me very thankful to John for all the blessings he brought to my life since I first became aware of him when I was 13. I really wanted to do something on my birthday for John so I made a donation in his honor to the Elizabeth Glaser Pediatric AIDS Foundation, an organization John supported. I hope one day a cure will be found and that the Jeffs of this world have many 31st birthdays. Also, I really liked the "Medium and the Message"-inspired M&M idea. I bought a bag of packets of mini-M&Ms and handed them out. It was neat to see even adults' eyes light up over the candy. I saw one person again the week after my M&M RAOKing adventure and he thanked me again so I knew it must have been something that cheered him and I hope maybe he went out to brighten someone's day, too. Me and my team paid it forward in recognition of Mandela Day at The Island Project. We bought £250 worth of gardening items, toys, animal food and a new rabbit hutch then delivered all the items and donated our time to build the hutch. I am giving my backyard a makeover, including planting two young papaya trees in honor of John and Lynn. Hopefully, they will bear fruit, but they will need some TLC and no hurricanes! My ROAK for Lynn's Birthday. I made a donation to Lynn's church (St. Andrews UMC) for the Food Pantry and Youth program, as this was near and dear to her. I was in Disney World last week, and made a donation to the Disney Worldwide Conservation Fund to better Earth, as was suggested by Ellen. I also am sprucing up my yard - as temperatures permit - now that I'm back home. I'd volunteered a couple times at a place since PIF started. Because of that, I wound up on their email list. So last week I was feeling sad because months back I'd added a reminder to my calendar to send Lynn a card last Thursday or Friday so it'd be sure to be in Amory by today. I never deleted the reminder. Thus, it popped up last Thursday. A couple hours later, I got an email from the organization I volunteered at asking for help with a card shower for a boy staying at their facility while he waits for a transplant. His birthday? June 21. So even though it wasn't the card I intended to send nor did it go to the person I intended to send it to, I felt comforted by the fact that I was still going to be sending a birthday card just when I'd planned to. It got even more perfect when I went to go buy the card. I didn't have the foggiest what sort of card to get for a teen boy. Everything seemed either too adult or too childish. Finally, I came across one that seemed age-appropriate. It had a train theme to it... which made me think of Amory. I just thought it was so amazing how it all turned out. I was only on that mailing list because of a RAOK I did for John. Because of that, I got the opportunity to do something that really helped me with Lynn's birthday and, I hope, helped to brighten a boy's day. my RAOK today: creating and finishing a wonderful presentation on healthy relationships for use in schools given the increase of domestic violence between young couples on the playground. If any of you guys are involved in schools and want the presentation and video that comes with it let me know! Police here will be using it in our secondary schools but can be used by anybody. Even for your kids. It focuses on what a healthy relationship is and is not. Show and tell: Like many, I'm not lucky enough to live in a rural area. 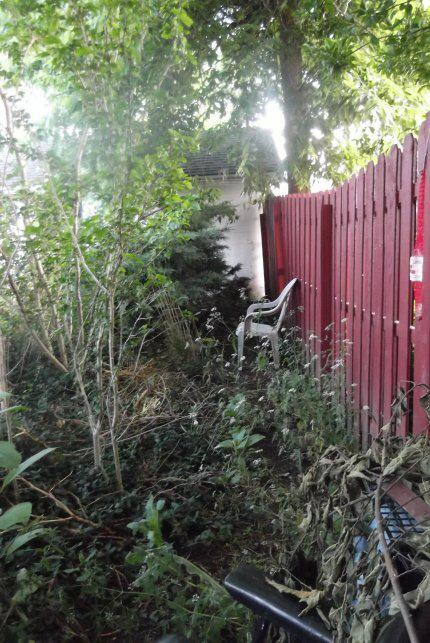 I've turned my 50 x 30 back yard into a haven, with a small veggie garden, bird and squirrel feeders, etc.... Across the back of my yard, I've created a 'corridor' so as to be completely invisible to anyone, even in my yard. :) Trees overhang the fence, you see, forming a ceiling... and I've blocked the front with a 'wall' of evergreen, rose of sharon trees, honeysuckle, and general wild overgrowth---intentionally NOT groomed. Made myself a nice little place to hide from the world, for a while---quickly---right out my back door---a few minutes before work, after work... it's nice. The point: I wish my camera would do it justice, for I sat there tonight, around dusk... when all of a sudden, as if a conductor had waved his hands for all to stand... HUNDREDS of fireflies rose up from their roost and LIT UP... IN UNISON... I sat there surrounded... every 6 inches in any direction, there was a firefly flashing... it looked like CGI! Literally made a little *gasp* of surprised delight... as you can see, that's NOT a very large area for hundreds of fireflies. They were PACKED in. Give this some thought. It's wonderful, and you may be helping do your part by creating some DARK where none can be found. A few weeks back I was looking into Memphis because I knew it was a city that meant a lot to John. I'd had no idea that the National Civil Rights Museum was located there until I found their link on a site about Memphis tourism. Clear on back to grade school, the civil rights movement intrigued me. It was always one of my favorite chapters in History class. In college, I loved reading the writings of Dr. King, Frederick Douglass, and others who worked for freedom and justice and love. So because of that, and in honor of John and his work promoting tolerance, I made a donation to the museum. I'm not sure if this relates at all to Season 5, but I volunteered at the Hope Mission Food Bank to assist those in the community to obtain valid identification. Many people who have been indigent, incarcerated, marginalized in some way, have no way to obtain a driver's license or picture ID if they do not have their birth certificates or other identifications. It's almost impossible in this culture now to do anything, such as be employed, rent or open a bank account without ID. It's a long process, necessitated after the laws changed here in Florida after 2010. United Way funded all the applications , and hopefully, it's a new beginning for many. Not what I usually do in volunteering, but a very necessary assistance. Way to go, United Way! Elisa is contributing to the American Foundation for the Blind. She writes that she is "contributing money to help the organization to continue to help those who deal with sight loss I never dreamed this would happen you know I mean I knew the first day I began to contribute to Braille Institute of America something inside of me told me that there was more to come along the way. This is a new way for me to honor John and Lynn Dye may they be proud of us all for our efforts in our communities I didn't realize that by helping one organization other organizations were going to need my assistance also." I have been privileged this past week to witness my own " Psalm 151". A 7yr old boy from our community, Lewis Mighty was battling a rare form of cancer and his parents had been told that he had deteriorated and would not live past last weekend. By Monday, Lewis was still making wishes, one of which was to have his beloved pet dog come to the hospital and the second was to be the no. 1 trender on Twitter (don't ask me). So the community, myself included stayed up past midnight on Monday tweeting like crazy, with celebrities soon joining in and by the following morning, Lewis had his final wish, to be the no. 1 trender on Twitter. Lewis lost his fight in the early hours of Wednesday morning after giving instructions for his funeral. I donated in his memory to the ward which cared for him and for which a fund has been set up in his name. I have been proud to witness the true spirit of Paying It Forward in my community to a little boy who was determined to make a difference. The theme/motto for The American Cancer Society's Relay for Life is Celebrate. Remember. Fight Back. I participated in the Relay for Life event in my area by being on a team from work. We set a goal for raising money and we exceeded that goal. Our team walked in the Relay with 5 of us staying the entire time 7 p.m. to 7 a.m. It was great working with this team. The S5 episode this connects to is Godspeed. The characters in this ep had to work as a team. The community supported their mission by coming together and celebrating the mission and the people overcoming odds to get to that point. One of those characters had cancer and she was fighting back. The episode also focused on remembering and celebrating loved ones and admired ones who had passed away. And, Sally Ride made an appearance and she has been 'fighting back' to promote women and school girls in science related fields and working in areas dominated by men. For my first TBAA Season 5-inspired RAOK, I officially signed up to be an organ donor. I had back when I was a teenager and first got my learner's permit but I don't think it "stuck." So this time I filled out the form on my state's Donor Registry. "Hearts" depicted just how much impact organ donation can have and I hope that, when the time comes, the end of my life might mean the beginning of a second chance at life for someone(s) else. One of my RAOK's for this month is helping my Relay for Life team raise money for cancer. We collected items for yard sales at the school and for the surrounding neighborhood. Our first yard sale raised over $300. We also are being 'sponsored' by our students to walk in the relay and we are selling 'blue ice' (from a local ice cream shop) which gives us 50% of the sales. We have one week until the relay event and we are already planning events to do for next school year! Elisa is volunteering her time getting the word out about ORBIS and helping to raise funds for their work. Here's my new PIF in honor of John and Lynn Dye. Orbis International helps blind children receive medical treatments such as sight saving surgery and it doesn't cost a lot I was asked because I am a contributor to an organization for the blind and visually impaired here in Los Angeles California they are located in New Hampshire Etna New Hampshire to be more specific I felt that this would be a great cause to donate who would have thought that something that starts with just a nickel would help others who are struggling with sight have a brighter future with the gift of sight. Note: On April 15th, the sixth month anniversary of the Pay It Forward in Memory of John Dye site launching, we observed John's Day. People were encouraged to avoid complaining and try to see the positive in themselves and others in addition to continuing to "pay it forward." Below are some John's Day reflections. I handed out 5 bus tickets today and encouraged all my friends to get involved at the food banks in their areas. I'm still in a Hospital, so...I couldn't do anything personally for Johns' day! :-( But, I had my daughter pay a single mother of 3 (whom I didn't even know! But, knew lives in an apartment complex near my home), who is only on welfares' rent for 2 month's. Also, the day after John's Day, I went with some co-workers to help prepare dinner for families staying at the Ronald McDonald House. We'd done it once before and were truly touched by the experience. It's no wonder there's a waiting list to volunteer for this! It's a blessing to be able to provide people who are away from home for often heartbreaking reasons with a homemade meal and share it with them. My John's Day RAOK: It was Sunday and I stayed at home to do housework, schoolwork, and my taxes. I tried to be kind to myself, and not fuss because I was doing my taxes so late. However, I have really put this 'day of no complaining' to the test as I tried to do it all week. It certainly helped for me to help host some homeless families at my church. This put things into perspective for me. The hardest area for me this week to be positive and not complain was at work. But at least I have a job I love and am able to support myself and my whims and hobbies. These homeless families are all strong families who suddenly found themselves in a situation where the main breadwinner was without a job and all their options ran out. They are away from family and friends and had no one to help them (at least one family was new to the area). Two of the families had newborn babies as well. They are trying to maintain as much normalcy as possible-keeping their children in their same schools-including college, spouses keeping their jobs, going to school to finish a course or add on to a degree, and job searching. So here they are, living together, in various churches, helping each other out, and looking for new careers and opportunities to get themselves back into a home. My April RAOKs: I am continuing to make donations to Relay for Life through activities at work...We have a team this year. I witnessed a fender bender and stayed with the persons until help arrived. My assistant at work has a child who attends the local high school in our home county-he is participating in a school fund raiser and I made a donation to that as well. I scrapbook once a month and this month, our hostess wanted to celebrate her mom's birthday with her family and asked me to be the hostess. This week was also my churches turn to host homeless families. We had three delightful families! I got to talk with the adults, feed the newborn babies, and talk with the older children. I even helped one with his homework. I took food and ate with them one night this week and on another night I spent the night with them...helped them settle for bed, and helped feed and prepare to leave the next morning. 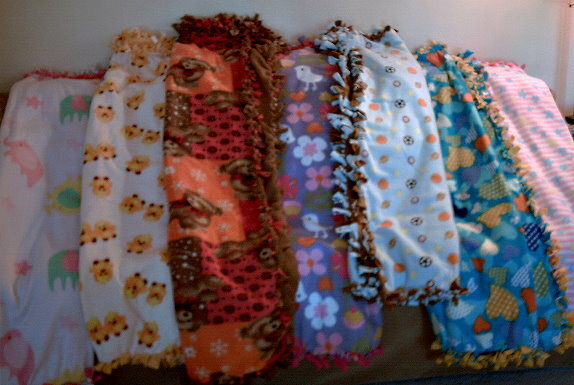 I spent this past Good Friday finishing the last 3 of the 7 fleece blankets I wanted to make in memory of Lynn. I'd been trying to think of what I wanted to do since her memorial service. One thing that really stuck with me was how Lynn reached out to young people and counseled and consoled them. Thinking of that, I decided that this batch of seven should be larger than the ones I made for John. Those were for small children but these seven will go to adolescents who are confronting difficult situations. After I'd finished those, I made a "Faith, Hope, and Love" pillow for a loved one who had recently had surgery. I make throw pillows out of fleece and then sew on three pockets. Inside the pockets I put a felt cross (faith), butterfly (hope), and heart (love). I started making pillows similar to them shortly after John passed away and have kept it up to let people know they're in my thoughts and prayers and also to honor and remember John. My RAOK this week, was on a train with reserved seating, gave away my reservation to a young girl. I sat further down the carriage with a work colleague but at least the young girl had a guaranteed seat for her journey. For March I wanted to do a n ew RAOK but then I lost my Grandma and since then my concentration's been pretty well shot. But one thing I could do was make my angels. So I did. The largest batch yet. Some in memory of John, some in memory of Lynn, and some in memory of my Grandma. Even though it's not exactly what I wanted to do this month, I think it was what I needed to do. To remember, to relax, and to heal. Back when my Grandma was first diagnosed with cancer, I told Lynn and she said she'd pray for her. And so when I next spoke to my Grandma on the phone, I told her that. And I explained about PIF and John (who she remembered from Touched). Knowing she was being prayed for meant so much to her and so when next I saw her, I gave her one of the first PIF angels I had made. She kept it with her when she napped that day, tucked up on the pillow. I've been thinking about that a lot lately: Lynn praying for my Grandma and my Grandma being so appreciative. And I remembered how comforted I've felt when I knew people were praying for me. So I did something new with this latest batch. Before I passed them along, I held each one for just a moment and said a prayer for whomever they wind up with. I hope that the people who find the angels I dropped today and will deliver in the days to come will be blessed by God's love. As for me, I am grateful that I was given time to be inspired by two wonderful women of faith and strengthened by the encouraging words of a man of faith who urged us all to remember that death is not the end. In February, I continued to pay for the person behind me in the fast food drive thru line...that is such fun! Also, I paid for someone to attend a scrapbooking retreat that is held in Feb. every year. This retreat starts on Friday and lasts through Sunday, food and lodging included. This person had never been before, and she had a great time. I also looked for ways to assist people when I was out and about. For March, I've made a donation to the Salvation Army for the tornado victims, and have joined a Relay for Life team giving a donation, (5 dollars each week I wear Jeans to work) and helping raise funds for the American Cancer Society. I also purchased a set of nail shields from Jamberry Nails. They will donate 2 dollars of that purchase to the Pay It Forward Foundation. I did something that i hope Lynn would approved of.. there is a young woman who.has no family, and little money. She is working as a delivery person for a store near my apartment building. She.needed a new pair of boots but couldn't.afford.a new pair, so i gave her a pair of boots i had just bought. They fit her perfectly! The.next.time.i was in the store she told me how happy she was.to have them! Yesterday I just really wanted to get home from work as quickly as possible so I could be with the group and light a candle for Lynn. Unfortunately (or so I thought at the time), I had a pretty vital grocery store run to do. I intended to rush through the store as quickly as possible, only stopping for the necessities. But right before I got out of the car, I decided I had to grab some of my lil PIF angels and drop them... for John and for Lynn, too. But when I got in the store I was so distracted that I forgot except for one and I can't even tell you where I put it. I don't remember. I was wandering through the soda aisle when I saw a lady who seemed to be searching the shelves. She told me she was looking for regular 7-Up cause she needed some prior to a medical procedure. As I was trying to help find some, she started telling my mom and me that she was kind of nervous because she worried she'd put it off too long. That's when I remembered the angels I'd haphazardly stuffed in my purse. So I gave her one and she seemed really touched as she held it. Ma'am, if you happen to read this I hope and pray you got the results you wanted. Thank you for giving me the opportunity to honor a beloved friend and her son. A few days ago I donated $30 to a wonderful cause here in Australia called the McGrath Foundation, which is for breast foundation. It made me feel really good that I did something for a good cause. Hello friends, my friends, I have an idea which I have okayed with Jim, and I hope you also think it is an OK idea. As you know I have written, with the help of my mum, a fantasy novel set in Sherwood Forest, UK whilst geocaching. My boys Lance and Aron are the stars. It's aimed really for 9+ yrs of age, but one of my customers who downloaded it is 71. Unfortunately it is only on Amazon Kindle in America and Europe, I believe. What my mother and I would like to do is, for every member on this site who decides to download on their Kindle or laptop or Ipad, basically anything that has internet connection, we will donate all our profit from each sale to Lynn and Jim's chosen charities. We would normally receive 70% of each sale. In the UK the novel is selling at £3.08p of which £2.06 we would get back. So as you can see, a huge chunk would go to the good causes. Please go to our Charities page for more information on this wonderful offer! To commemorate the first year of the death of John (with a few days late), I made a donation to a Swiss cooperative (Make-a-Wish Switzerland) that helps sick children realize their dreams. I would donate every year like that I help sick children and I maintain the memory of John alive. I really wanted to do something special this New Year's Eve to make John part of it. Cause, whether I knew it or not, he was there for every New Year's I've ever known. And I just had to feel that way still this year so decided a Paying It Forward evening was in order. My mom had casually mentioned a couple weeks ago that I should check with a local center that helps abused children to see if they needed blankets. They're a safe house for children who have been abused and they help out when kids need to testify. Also with counseling. So last week I did check their site and that's when I saw that they really, really needed blankets. So on New Year's Eve, my sister came over and we made blankets for the kids. My mom helped with supplying some of the fleece which was great. It made for a fun and meaningful evening for my sister and me and I hope our work brings smiles to the faces of kids who definitely deserve happiness. I feel like this is really appropriate cause even though I was an older kid when I first noticed John on Touched, he just made me feel safe. So my hope is these blankets will give kids those feelings of safety and comfort that John imparted to me. And come to find out... all this fleece I've been getting is coming from Tupelo, MS! So now I really feel like John was part of my ringing out of the old year and ringing in with the new. That's definitely a blessing for which I thank God. Merry Christmas. I am "Paying It Forward" in a different way in my community by being a contributor to the programs at Braille Institute of America which is located in Los Angeles, California on Vermont Avenue. This year my work place "adopted" the family of a child at our local Ronald McDonald House. So last night I had the pleasure of picking out a tea set for the lil girl. When it was first brought up, I really wanted to do this not only to help a sick child and her family but also because it's a chance to do some good with my co-workers. One of the many things I really admired about John was that he seemed to genuinely care for and love those he worked with. I've always been something of a loner in the workplace so I felt like working with my officemates on this would be a really great way to honor John. We already have something planned for next month, too! Also in the spirit of community, I'm trying to make a point of reaching out to people I've lost touch with over the years without ever meaning to. Whether old friendships resume or not, I just want them to know they're being thought of warmly. It's a busy season, so I'm just trying to be aware of others and do what I can in that moment. Each time I go to the grocery store I donate to their feed the hungry program...they just add the amount to my bill. I bought a doll and some matchbox cars to donate to Toys for Tots. As I unpack and decorate for Christmas, any decorations I don't think I'll use again go into a box to be donated or I'm taking them to school and allowing my students to "win" or "earn" them-these are underprivileged children. I helped a lady look for her car key the other day...it fell off her keychain in a store. My church and other churches and schools have several opportunities to contribute to causes and serve others and I am participating in some of these. My nephew pointed out that our cantata's and plays we are performing at church and school are our Christmas gifts to God-as well as to others. I helped my brother and sister-in-law this past weekend ready their house and serve their company and gave them some down time after everyone left by taking the kids to the movies. I am also getting word out about this site to others. I just wanted to share with you that I have been asked by the Meningitis Research Foundation to be their ambassador for my local area. This will involve me helping to promote awareness of the disease in schools, colleges, universities, doctors surgeries and hospitals. I am incredibly honoured to have been asked and will take up the role in order to Pay it Forward in John's name but also in memory of our dear friend Marcel who we lost 2 years ago this Christmas/Boxing day to meningitis, he was just 36 and left behind a wife and two little boys. Out Christmas shopping this evening and spotted a collection site for gifts of toys which will be distributed to children from under privileged families in our city. So, off I went to the nearest toy shop and bought a baby doll and all her accessories and then went straight back and put it in the collection box - my random act of kindness almost moved me to tears thinking of a little girl getting her baby doll on Christmas morning. So lovely to see all the other gifts of toys in the box, great to realise that people do care!! I have been volunteering with the non-profit prison book project in my town that for the last 18 years has been "touching lives behind bars," distributing books and CDs to over 1,325 prisons and jails in all 50 states and 29 foreign countries. The material is of a spiritual and educational nature. The letters we receive from inmates are so remarkable, thanking us for expanding their minds and horizons to rehabilitate themselves and help others. I remember all the shows where the Angels visited their assignments in prison. I like to think of the books we send out as flying to those in need on angel wings. "I was in prison and you came to Me. of the least of these My brethren, you did it to Me." The first Saturday of December every year we host a Green’s party at my house. We do this in memory of our son. This was our tenth year. 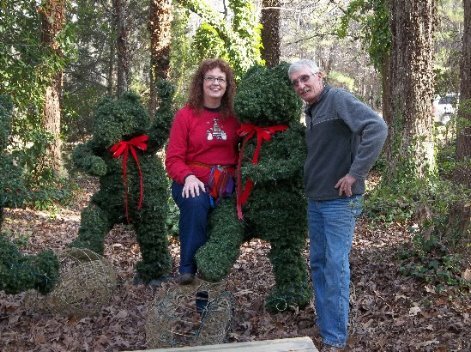 We invite everyone to come over and make greenery to use to decorate their own homes for Christmas. We gather all kinds of greenery from our property and others contribute as well. We have an assortment of ribbon, ornaments, embellishments, frames and containers to make wreaths, swags, and centerpieces, anything you can think of. People can bring their own supplies as well. We spread everything in areas throughout the yard. We set up work tables and supply tables throughout also. We then assist everyone as they make their masterpieces. People can make as many items as they want. I serve hot chocolate and/or cider as well as soups as we work outside and the temperature can be cold. It is a wonderful way for our friends, families and coworkers to meet each other. They share ideas, and help, and most of all, friendship as they work together. I have a huge chalkboard on my porch that everyone signs. It is always an enjoyable day and a good way to kick off the Christmas Season. Today was a beautiful day. It was sunny, a little windy and cool but I had the spirit of Christmas in me sssoooo..I went shopping. I have almost everyone done. I will go again tomorrow and finish up except for the baking....I love Christmas time. People put out more of an effort to be nice...even me....I stopped at Tim Hortons for some timpbits for my great niece and nephew and I payed for the order behind me in the drive thru lane....I'll bet they were suprised...The cost of one tea and one coffee put a huge smile on each of their faces....I told the drive thru cashier to wish them a Merry Christmas...I had a good day....God is Awesome....It realy does the heart and body good to be able to do for others...even if they know who provided the kindess or not.I hope and pray that tomorrow will be just as good. We adopted a dog from a lady because it was causing her stress and her glucose was going up. My mom announced today that she needed me to write out a fancy label for her because she was making a Christmas cake for my brothers RAF flight who have just been deployed to Afghanistan. So I told her that she had just performed a Random Act of Kindness and asked her if I could share it on the site. She agreed and added that she was extremely proud and honoured to be able to do this for our serving airmen who will be away from their homes and families this Christmas. I am very involved with our local animal shelter; it is my job and also my hobby, as well as with my church. I work in the administration department, sending out Thank Yous to donors and helping with fundraising as we are non-profit. We also work hard to educate the public about spaying and neutering as well as vaccinating to prevent disease. We see lots of animal abuse and neglect which is heartbreaking. I love working with the animals and for the greater good. I carry a leash in my car at all times and will stop for any stray animals as i can't bear the thought of them being hit or not being fed. There is so much irresponsibility out there and they pay the price. I am a member of a church that is very involved in our community. We do so much outreach that was lacking at my last church and makes me really feel that we are acting as Jesus in our community. It's so important to me to reach out to others, especially those less fortunate. I am all for bringing common courtesy back to my town as it seems to be lacking everywhere and it has to start with me! Over the past few months, John has become a big part of my life. Even though he is no longer with us, he has brought so much to my life through my involvement with the site, so I wanted a special way to honour him. I wanted to Pay it Forward but also have a lasting memorial to John. So when Lynn (John's mom) told me how John had brought her to visit England & Scotland, the idea came for a Random Act of Kindness. Scotland is incredibly close to my heart, it was the place I got married and the place I go to for peace & quiet. So when the opportunity arose to plant some trees at my favourite retreat, I decided that this would be a fitting and lasting memorial to John. My hope is that future generations will benefit from my Random Act of Kindness to Mother Nature. This week is my church's turn to host homeless families in a local ministry program. The families sleep in one of our buildings at night. They arrive between 5 and 6 in the evening and volunteers from my church bring them a meal and eat with them. Then volunteers come in at 8:00 and spend the night with them. They have to be out of the building by 7:00 a.m. The host's duties are to make sure the families are safe, building locked, and to keep the family company if they want it. I and another volunteer spent Sunday night with a delightful family. It was a mother, teenager and child. They had school the next morning, so played with the child for a little while, then gave the mother directions for getting out of the neighborhood (she had her own car) to take her children to their schools and back to the day center. She was preparing to go job hunting. Then my "duties" were to make sure the facility was clean and lights turned out and locked up for the day. They are using the youth building to house the families. The "living area" has a big screened t.v. with dvds and videos, a nice comfortable sectional sofa, a few tables to eat at or play board games or cards. Reading material, art and craft material for the kids, and lamps and plants scattered through out all the rooms. The kitchen is stocked with appliances, food and eating utensils for the guests to use as they would like. They have snacks, food for breakfast if they want and food to make for sack lunches if they want. Then they have their bedrooms. Each family has it's own "bedroom" with cots set up and these rooms have small tables and lamps for reading and or writing as well. All the rooms are painted and decorated very warmly and cheerfully (remember, these rooms are the youth Sunday School and Youth Activity rooms the rest of the time). The "hosts" also have their own "bedrooms". It was very comfortable. The only drawbacks, are the restrooms are just equipped with sink and toilet...the people have to shower elsewhere, and they don't have hot water. And sometimes, depending on the number of families ( they've had up to 13 people, I think) it could be a little crowded and chaotic when it's time to get up and prepare to leave. And, of course, sleeping on a cot. But, the place is heated and air conditioned, and the best thing is the families can stay together. They are not split up according to gender as many shelters are -they can still function as a family. I know this site has affected my thought patterns. When I was driving home from the mall a few days ago I saw a man with a sign up asking money etc. I don't know if he is legite or not. I simply drove to Mcdonalds and got a gift card so he could have something to eat. I am not probably going to be able to change the world or probably even come up with the best idea of volunteerism but I have become more likely to jump in and do something. I think just getting that message out is a great start. I think the cards are a great way to do this. I had some printed up and have left them places and intend to leave more. I like the concept of "random" acts of kindness it may not be some earth shattering event but may just come with a positive attitude or smile or being more courteous when driving. All of these steps do help make our communities better. My passion is still providing things for my friends who live under the overpass! I do not hesitate to ask friends and others for donations! Right now I am collecting gently used blankets, sheets, and pillows. I usually do something once a week! My son and his family live in the Atlanta area. Once a month they work at a homeless shelter. This began a few years ago as a ministry their church did. They have since changed churches but they still volunteer at the shelters. My 10 year old grand-daughter, Emily loves to write. She has a blog on the internet. She posted on her blog a couple weeks ago that she has decided she needs to use her talents for Jesus. She has been writing stories, or "books" some she has even entered into writing contests. Her plan to use these and future stories for Jesus is this: she will "sell" her "books" for 50 cents to people. The money she raises will go to 2 specific homeless shelters in the Atlanta area. A few years back some friends and I had a little project in which we dropped angels I had made in various random spots throughout our cities. There was a tag attached to each that read "God loves you!" We were all fans of John and that message was something we looked forward to hearing every week when Touched aired. And it was a message we wanted to carry to those around us, friends and strangers both. We hoped and prayed that those who found the angels would be touched, inspired, and, above all, know that they were loved. In the years since I made those first "messenger angels," my appreciation for that all-important message that John and the Touched cast and crew delivered has only deepened. So I've decided that as one of my "paying it forward" projects I'm making and distributing angels once again. This time each comes with a card about our site, inviting the finder to help us celebrate John's life and "make a difference in your community." On the back of the card I've hand-written those three vital and sustaining words: God loves you! I pray that those who find the "Pay It Forward" angels will be blessed with the knowledge of God's love and inspired by John's life of compassion. I was cleaning out my closet and I got an idea of something I could do to "Pay it Forward". I had several purses that were very lightly used and a couple that had never been used. These were very good purses and I felt like it was terrible to just let them sit there. I remembered a friend telling me about an organization called Dress for Success. They take donations of clothing that is suitable for business attire and they sell them very inexpensively or donate them at their botique's. They are an organization that is nation wide. This helps women get back on their feet. It gives them an opportunity to dress nicely when going on job interviews or when reentering the work force. When I took the purses down I enclosed a laminated PIF card into each purse. The ladies at the Pay it Forward office where very excited about the cards and the idea of the site. They seemed very receptive to the idea of my mailing more of these cards to them. I have had some business cards made up just like the ones on the site because I think they look more professional. I am going to send them to Dress for Success as well as some other organizations. I am really excited about this opportunity to Pay it Forward. I went on a shopping trip this weekend and made a conscious effort to look for ways to help people out. I had remembered a long time ago someone speaking at a retreat about looking for ways to be helpful and courteous to people-the opportunities were there, we just had to be aware of them. Simple things like holding doors, helping them reach something on a shelf or pointing out something in the store that I overheard them looking for... At one point, I was coming out of a store and the escalators were right there. I saw this woman step onto the escalator and she was holding a man's hand and he hesitated. Didn't get on, so they got separated, she motioned for him to step on, but he didn't...he was holding a cane..so obviously was unsure of his footing. She tried to "back track" and get off the escalator but other people were stepping on and she was too far along, and so she motioned for him to wait, she'd be back. So I walked up and asked him if he wanted me to help him get on. He was very shakey, and my impression was maybe he had Parkinson's. He said, no, he'd wait for her. So, I stood there with him until she got back, then I asked her if she wanted me to help. she said no thanks, she would just take him to the elevator. But at least he didn't have to wait alone, and she would have had some help if she wanted to try the escalator again. For most of my life, I have always tried to do "nice" things for people. Have always put others before self and knew that I was on a journey and that one day, everything would come together and my life's purpose realised. For a number of years I have sponsored two tibetan children who's family had sent them into exile and to the safety of The Dalai Lama, I have held fundraising events for their Tibetan's Children's Village in India. I became a caseworker for the charity Soldiers, Sailors and Airmens Families Association (SSAFA) and held more events to raise funds for our serving and retired servicemen and women. I was a volunteer for Childline UK dealing with abused, bullied and suicidal children. All of these initiatives gave me much pleasure and raised much needed funds for their causes but my most rewarding times have been the "random acts of kindness" that everybody is capable of performing. Like the time I bought an elderly lady a cup of tea as she had left all her money behind in the car and couldn't afford a cuppa or like bundling my students in my car when their taxi didn't turn up and getting them to their train on time. I am a big believer that the little things count, a smile, an encouraging word or a reassuring hug. Earlier this year, I watched my first episode of Touched By An Angel and was introduced to "Andrew" a character that touched my heart. Through Andrew, I learnt of John and his kind, compassionate soul. I joined with like minded people who wanted to create a lasting tribute to John, the person and to continue the caring, loving work that he started. Now every day I make the little things count, I take time to appreciate what is around me and the needs of others. I am incredibly privileged to have worked with Jenni and Cindy in creating this site along with John's parents. I have hopes that through this site we will encourage people to make a difference in their communities by honouring John and Paying It Forward in his memory. There are so many, many things I am thankful to John for: helping me to cope with the loss of loved ones, giving me hope during my high school and college years (and beyond), and bringing so many wonderful friends into my life. But one thing I haven't always recognized is how big of a part he played in breaking me out of my shell. As a lifelong introvert, I don't do real well with striking up conversations. But thanks to John's example, I've found myself doing things I never would have before. I don't shyly avert my gaze from people on the sidewalk any more but greet them and help them if they look like they need it. This once lead to me babysitting three little girls for about two minutes while their dad retrieved his wallet from the car so they could go to the cupcake shop. Without John, I may not have had the opportunity to visit with these lil kids about cupcake flavors. Who'd want to miss out on something like that!? So I've recognized that sometimes "paying it forward" means moving beyond our comfort level but this is a good thing. I've also learned to reconsider how my interests and hobbies might benefit others. All my life I've tried my hand at various crafts. I enjoy it immensely but sometimes never saw much value in what I did beyond it keeping me busy. But then I got to thinking about how John bravely put his talents out there for the world, hoping to make it a better place. So I've been making more of a point of using my own to touch others' lives. I've made pillows for those facing illness and hospital stays. I've made jewelry and trinkets for those who just needed a lil emotional boost. And as I work on each pillow, earring, etc., I think of the man who inspired me to create them all and use what God gave me to share His love. My church had recently partnered with a ministry to homeless families in conjunction with other local churches. As a host church, we provide meals and overnight sleeping arrangements for homeless families. When we first started this, I was just donating money for meals my church provided. I didn't pay much attention to it until after January. I then learned how John was involved with feeding the homeless-working at his hometown food pantry. And, a Voice inside my head told me to do more. So, I went to an informational meeting about it-after all if John thought it was important... But you had to go to training and I didn't. Over the summer, I did begin buying items requested for the families during their stay...games, school items, dvd's-stuff for them to do before they went to sleep. Yet, this still small Voice kept egging me on to do more-to get involved with the families. Finally in August, the request came for more females to spend the night with the families as they actually sleep in the church building. This was about the same time John's mom told me that John would carry his left over food from restaurants to homeless people -I imagined him literally handing containers of food to homeless people and chatting with them. And I thought how uncomfortable I would be talking and interacting with homeless people but, that Voice said, "Do this" . So, I made an appointment with the coordinator for my training, and I am now trained. I did not participate with the last rotation, but am expecting to when the next one comes around. I listened to the Voice a little quicker than I normally do because I kept thinking "John did for the homeless, I can too". and, I did not know that until I started writing this up and checked some facts on their website. Another reason I really am beginning to wonder if John truly was an Angel. And, no, the Voice was not John, it was God, but makes me wonder if John was standing next to Him when He spoke to me. I have donated many clothes to the mission at our church for the homeless. I have also made a small donation. This has been one of my favorite charities because I could imagine myself or almost anyone ending up in this situation. I know homeless charities were one of John's that he was involved with as well. I have also been donating through Elton John's Aids foundation did at the time of John's death and will continue to do so. I also each day try to remember that each gesture, and mood that I send out can affect each person that I come in contact with and I try to remember that it is like a "ripple affect" so I try to "pay it forward" with a smile or positive attitude that will reflect Gods great love each day. This is something I have to remind myself of because it is so easy to slip into a negative attitude and it truly does have an affect on everyone I come in contact with. My name is Priscilla and I am a semi retired registered nurse. My ministry as a job and as a volunteer has focused on Alzheimer’s disease and the death and dying process. God has given me the honor of being at the bedside of so many over the years when the angel of death came. Some were young as with Hospice and the cancer unit, some elderly in long term care. Long before I met “our Andrew” I knew there was an angel in the room. 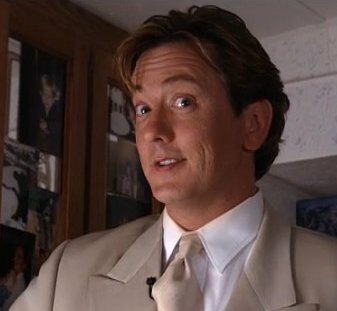 The first time I saw John as Andrew on TBAA, I felt like I had met an old friend. I could never see the angel but I could feel him/her, however, many of my patients would see him and talk to him prior to their death. “Can’t you see him, Priscilla, there in the corner” And another time, “don’t stop that angel when he comes to get me” For this, I have been greatly blessed. At present I work several days on the Alzheimer’s unit. I also support Love Line, which is a ministry for cancer patients’ families. At Christmas friends/families can donate a light in memory or in honor of loved ones. This Christmas John will have a “light” there. He was a “light” for so many, wasn’t he? I think his portrayal of Andrew has lessened the fear of death for so many. I visit in some of the nursing homes just to hug/love and talk a few minutes to those who are so lonely. It is hard to outlive your family and friends. I do “limited” cat rescue now because I have adopted so many that stayed in my home. I plan to continue my ministries as long as God will allow and for that I am grateful. If you would like to use the "leave behind" cards referenced in some of the reflections above, please visit our Introduction page for downloads. Thank you!